We’ve covered quite a few watches from Christopher Ward over the years, and many of us here at WWR have become fans of the value proposition they represent, along with some readily identifiable styles. My earliest exposure to the brand came from the C60 Trident line, and I’ve tended to gravitate towards those. Well, today, we’ve got a review of a watch that is quite a bit different from the Tridents, the Christopher Ward C1 Grand Malvern Worldtimer. If you couldn’t tell from the world map on the dial and the cities printed around the outside, the Christopher Ward C1 Grand Malvern Worldtimer is a bit different from the regular GMT watches I’m normally handling. This led to a little bit of a learning curve when it was time to actually set the watch. You see, the 24-hour scale with it’s day/night indicator is printed in counter-clockwise order, the opposite of what I’m used to seeing. Then, there’s the matter of the orange “search light” beam that comes out from the center – what’s that about? Well, on the Christopher Ward C1 Grand Malvern Worldtimer, that constitutes what we’d more commonly think of as a GMT hand. It’s a clever implementation in terms of the visual design, and it’s easy enough to set. In the first crown position, rotating one direction moves the 24-hour ring, and then rotating it the other direction will jump the beam to the correct spot that you’re wanting to focus on. While it may not be how others do it, I ended up setting the hand to be GMT time, so I could easily see that. What’s nice about this is that the beam itself doesn’t move, so you always have one spot on the dial to check to see what the time is in the spot you’re concerned about. 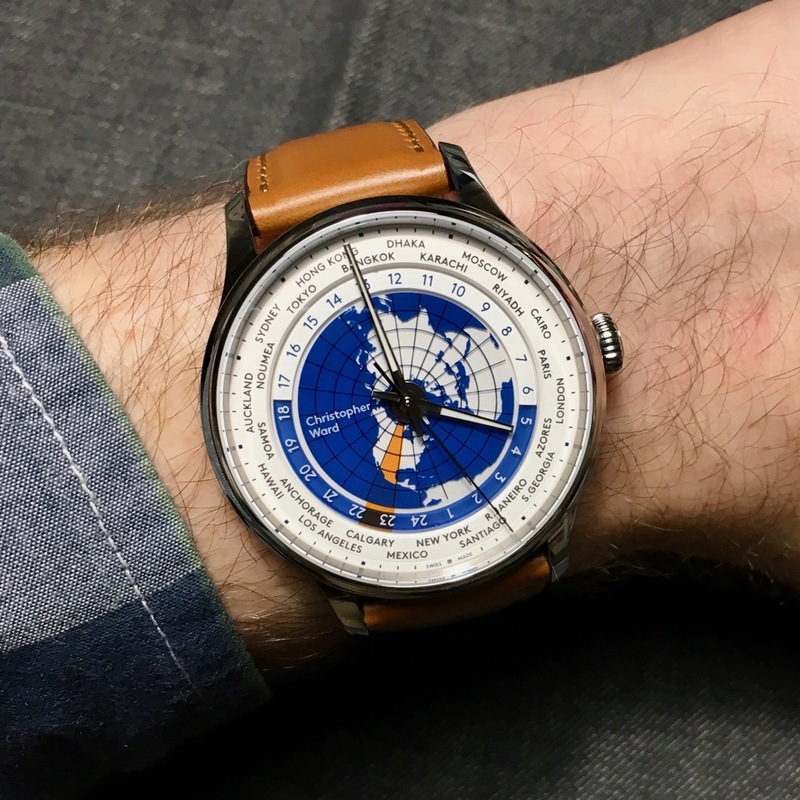 Then, with the cities printed around the chapter ring of the Christopher Ward C1 Grand Malvern Worldtimer, you can do some quick math to see what time it is anywhere in the world. Of course, you can also just check the regular, local, time quite simply with the polished baton hands that float over the world map. In that, the watch feels like a highly polished (well, it is) watch that’s a dressier piece equipped for world travel (or just keeping track of times in other places you’re communicating with). And yes, I realized during the course of my review time (and after the photos were done, unfortunately) that I did not have things setup for the day/night and cities aligned properly. I was reading the GMT properly, but it didn’t align to where the cities were, which makes reading the world time trickier than it needs to be. Once I corrected it to make sense (and moved the beam), I realized the mistake, but thought I’d call it out (rather than hiding it) because I may not be the only person to make this mistake. Just set the 24-hour counter to align to a city you know the current 24-hour time of, and then move the beam to where you want it. For my usage, that meant it aligned on London, which – hindsight being what it is – makes more sense. Ok, now back to the review. Powering all of this for the Christopher Ward C1 Grand Malvern Worldtimer is their caliber JJ03, which is a modified ETA 2893 with Christopher Ward’s in-house module. CW has been doing more of that – building up their own movements – and most of these find their come in the C1 series. This allows them to play around with things, and of course increase the allure of it being an in-house modified movement contained in the watch. It also helps them to make a compact package – this watch comes in at just about 11.5mm thick, and only 94g. In wearing the Christopher Ward C1 Grand Malvern Worldtimer, I found it a comfortable watch between the thinness and relative lightness. On the strap (there are a few color options here) you’ve got a deployant clasp that you need to get adjusted properly. With the end of the strap going in, it layers that between your wrist and the metal. It does – as this sort of clasp does – add some bulk under your wrist, but I didn’t notice any discomfort from that. I did have some troubles with the clasp actually locking in place now and again, but that’s a simple check when you first put the watch on. Once it was on and locked, there wasn’t anything with it coming loose. All that was left, then, was to wear the Christopher Ward C1 Grand Malvern Worldtime out and about and see how it performed in the real world. Telling time on the watch is fairly simple, as the polished hands stand out against the world map, and the minute hand is a good deal longer than the hour hand (though they’re both similar widths), reaching out to their respective tracks. By and large, while the world city timing was interesting, I just didn’t use it all that much (but that’s just me). I did like how the world map was used with transparency to make a more visually interesting dial, along with giving some information around how the times are being reflected. Next articleThe Outdoor Vitals LoftTek Adventure Jacket campaign closes today!